This doesn’t even come close to the number of other powerful relationships Kate has, especially Julie her ward, Derek, Saiman and so many more. And Erra. Her undead aunt, the City Eater who is just perfect and awesome and I can’t even begin to cover all of what this means because this review is already becoming ludicrously – long but it’s just so much fun. Ooh oooh, I forgot the wedding! I forgot the evil Volv wedding planning and his feuding witchy parents! See, all this epic writing, excitement, amazing world building and it’s funny too?! Yes, I love this series and I’m just going to fanpoodle everything…. For POC we have a large number of characters who have long histories in this series. We have Kate, of course, of Babylonian descent who has only become more and more open with her history and past. Jim, the leader of the shifers, is a Black man and his mate, Dali is Indonesian. Raphael, prominent Bouda is Latino as is Ascanio, one of Kate’s staff members who is actually growing and showing a more complex side to himself. Mahon, the great bear and his family are all Black and Curran’s extended family. George, Mahon’s daughter, is married to the Latino/Middle Eastern Eduardo who was only a brief mention here but has a much more advanced depiction in previous books. George and Dr. Doolittle are also disabled and Dr. Doolittle is Black – both of these characters (along with Nasrin, Dr. Doolittle’s fellow medmage and middle eastern Muslim character) are more mentioned in this book than expanded on, along with the Indonesian and nearly blind Dali – but they’re characters with strong history and established presence in the series. 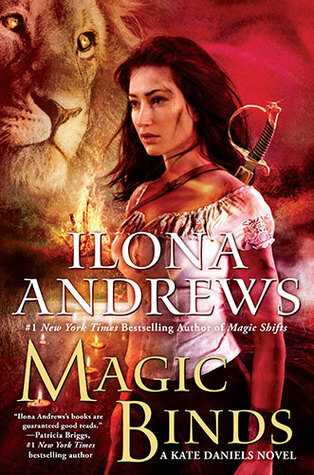 On top of this there is a vast array of briefly appearing chartacters from every subset – the knights, the wizards, the mercenary guild and there is an ongoing depiction of POC in more detail even for this background characters: such as a character not just being Black, but Tongan and describing the magic and ritual tattoos she has (which also works really well with the world building as it establishes Kate’s encyclopaedic knowledge). Some are only tiny roles. Some are major roles. Some have had long character arcs and histories that are essential to the overarching story – but overwhelmingly there’s a lot of POC here. This book series is the ultimate trap for me. I have books to read. I have a lot of books to read and review. But when I pick up a Kate Daniel’s book it is so very hard not to throw all those books aside and go back to Magic Bites and read the whole series again and again and again and again. With the amount I read it’s hard to pick among my favourite. But this series is it. Not just one of my favourites, but hands down my favourite. That’s not a slur on any other beloved series – this is just so good and keeps getting better.